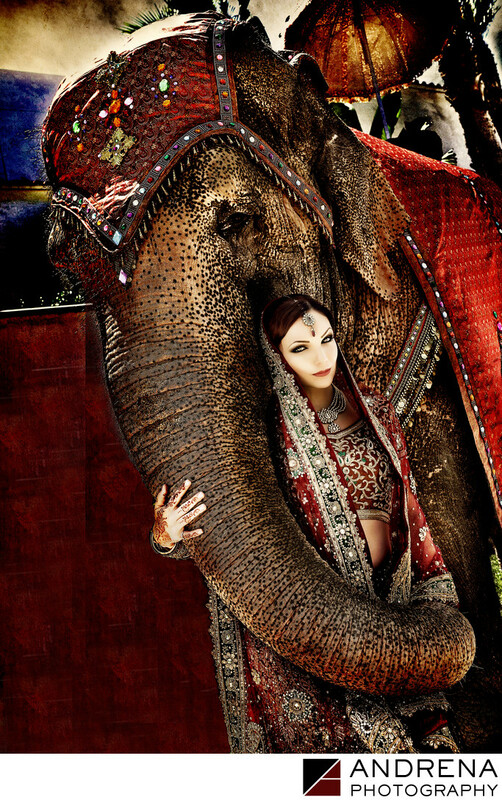 Most Indian brides don't want to be seen by the groom's family before the wedding, so my vision of an Indian bride with an elephant didn't materialize until just last year. My bride, Olyea Shah, is actually Russian, while her fiance was Hindu. When I asked her if she minded the groom's side seeing her before the wedding, and then explained my idea, she said, "I am Russian! I don't care one bit." Still, her wedding was early in the morning, and I didn't know if we could pull it off. The florist was running late (due to issues beyond their control), so our family photos got started a bit later than anticipated. Once we had gotten through all our groups, I said, "We've got to sprint to make it to the elephant before the baraat starts." So Olyea and I ran a few blocks, to where the wondrous Tai the Elephant was patiently waiting. I've worked with Tai a number of times, and she is the sweetest creature you could imagine. In fact, you probably saw her in Water for Elephants, starring Reese Witherspoon and Robert Pattinson. But I digress. Once I positioned the bride in front of the elephant, I was able to get her handler to have Tai lift her trunk around the bride's waist. Tai can only hold her trunk in one way, so we were lucky that the lighting worked in our favor. We only had a few minutes with Tai before we had to run back to the hotel. Later, I beat this image into submission by doing six hours of complicated Photoshop work on it. The end result placed fourth in the WPPI Premiere Category in the 2014 Print Competition. Unfortunately, there is no actual fourth place awarded. I just received the fourth-highest points total, and was happy with that, and the fact that the print received an award of Silver Distinction. Indian wedding photographed at the Huntington Beach Hyatt, Huntington Beach, California.